With all the pinning I do for crafts, I finally did one! Every Wednesday my mom goes over to my sisters house and I will go if I am not busy. Last Wednesday we decided to do a craft and we choose this one. It was really quite easy and quick to do, a perfect group craft! They had already purchased everything on one of the Wednesdays together, so we were all ready to go. They picked up the glasses at the Dollar Tree and the garland at Michaels. First we painted the base orange and the stem green. Then we added the brown lines and highlighted with some yellow in between the lines. And sealed it up with Mod Podge. We had such a fun day I am looking forward to our next craft day! Oh these are so pretty. What a great idea, so creative. Found your link on Flour Me With Love. Thanks for sharing this wonderful project. Wow! These turned out really great Paula. Such a wonderful idea. Over from Craft-O-Maniac and am your newest follower. Would love it if you would visit sometime and maybe follow back. Have a great day! i love this! it's so sweet and perfect for fall. Oh my gosh how brilliant is this!? I love it. I hope you'll add it to my Wickedly Creative Halloween Ideas Party-fall ideas too. Love this! I might be making a Dollar Tree run soon! Love this idea!! It's a such a great idea! I pinned this months ago, so happy to see this project actually re-created by a crafter. They look great!!! I got lazy this year and bought a few wire pumpkins for my centerpiece, fingers crossed I can eventually get this craft done myself. They look GREAT!!!! I sat staring for the longest time at your first pic trying to figure out how you had made those! They turned out so gorgeous, I love them. What a beautiful fall decoration and that's great that you got them at the dollar store. Now that's thinking outside the box! What a great idea! Your pumpkins are darling! Hey from tessacotton! Love your creation, I'm so impressed by the creativity! I would be so thrilled if you would link up to my new, halloween themed link, live today! Paula, I love your candle holders so much that I featured them on my blog, you can find them here. These are super cute!!! We featured your Halloween Treat box on In the Kitchen Thursdays. Come check it out! It was one of the most popular links. Our readers loved it! http://www.battlingthehomefront.com/2012/10/in-kitchen-thursdays-week-2.html We would love it if you would link up again! Adorable! Thank you for linking to our blog party! I saw you @ Battling the Homefront...these are fantastic. I must stick a "pin" in it for my copycat board...hope you don't mind. They look beautiful. Very creative and different idea for a candle holder. I will be pinning this one! These are adorable! Thanks for sharing your creativity at Potpourri Friday! That is seriously clever and creative!! Thanks so much for sharing this at Inspiration Friday this week! I LOVE this project! Thanks so much for sharing on Marvelous Mondays! I will be featuring this project on my blog this weekend. Feel free to stop by and grab a featured button. Visiting from The 36th Avenue linky party...and so glad I am! I love this idea; totally never would've guessed those were glasses. From looking at the picture I could NOT figure out what the pumpkins were made of. Adorable, and a must-do! These are so cute. I totally want to have a girls night and make these! pinning now. We're starting back up our weekly link parties and would love for you to join in. We are also giving away a $25 Hobby Lobby gift card to one lucky featured blogger. Paula - I have at least a million pins I have not yet tried! Haha You have inspired me to maybe give some of them a try. Your candle holders turned out so cute. And what a fun way for you to spend time with your mom and your sister and actually get something done too!! 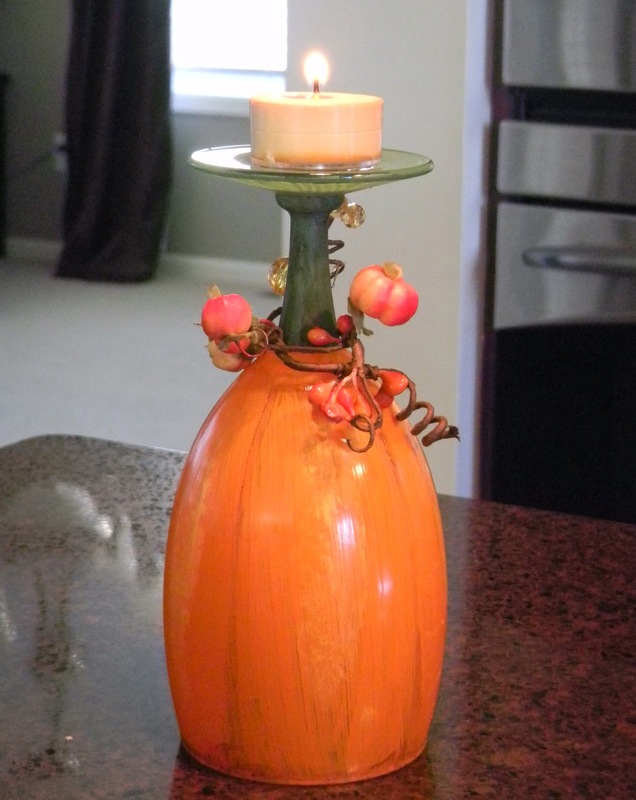 Those pumpkin votive holders are so adorable! Awesome idea! So crafty! I'd love for you to share this at my new linky party, Submarine Sunday. I hope you'll stop by! What a creative way to do candle holders! I'm featuring this tonight at the link party. Thanks for linking up! Brilliant idea! And they are super adorable! Thanks for sharing at the Pomp Party! Hope to see you back next week! Love these!! Such a great idea!! Thank you so much for posting on Saturday Show and Tell! I hope you'll be back this week with some more great stuff! Thank you for sharing your project on A Crafty Soiree! I'm pleased to let you know I've featured it in the newest one. Please come see it ☺, it will be up at midnight EST tonight. These are so beautiful! What a fun idea :) Thanks so much for sharing at Mom On Timeout! Hope to see you back tonight!